Two car bombs hit Somalia’s capital, Mogadishu, police say, adding that 22 people were killed. The first blast was reportedly followed by gunfire. Police said the first explosion happened near the Safari Hotel, which was largely destroyed by the powerful blast. Rescue workers are still recovering people from the rubble. The hotel is close to Somalia’s Foreign Ministry. "We know that at least 20 civilians are dead while dozens of others are wounded," Abdullahi Nur, a police officer told Reuters. "The death toll will surely rise. We are still busy transporting casualties," he said. Hussein told AP that the explosion occurred as security forces were following the truck that had raised suspicions. The blast apparently targeted a local hotel, he added. "There was a traffic jam and the road was packed with bystanders and cars," Abdinur Abdulle, a waiter at a nearby restaurant, told AP. "It is a disaster," he added. Witnesses say that the explosion was followed by gunfire. A second blast took place in the city's Madina district, according to police. "It was a car bomb. Two civilians were killed, " Siyad Farah, a police major, told Reuters. He added that a suspect had been caught on suspicion of planting explosives. 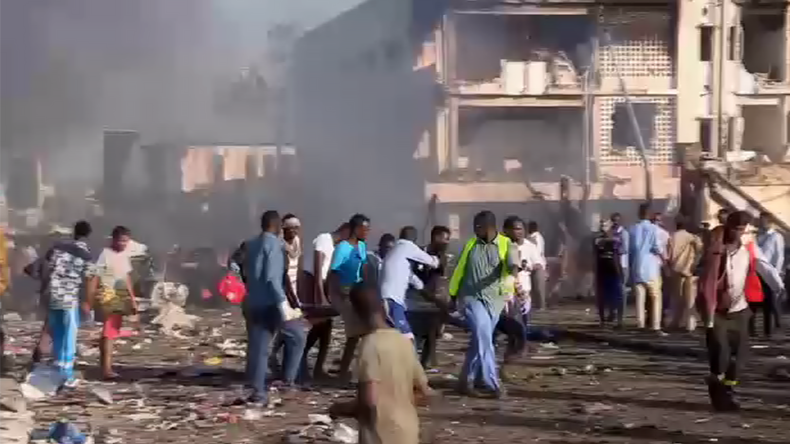 The blasts took place two days after the head of the US Africa Command was in Mogadishu to meet with Somalia’s president, Mohamed Abdullahi Mohamed. No group has claimed responsibility for the attack. However, the Al-Shabab militant group based in Somalia has recently staged attacks on army bases and city centers across the southern and central parts of the country.